Zachary Smith blasted a baseball into the night sky over Phil Welch stadium. The ball narrowly missed the outstretched arm of the Outlaw’s Centerfielder Zack Ehlen, rolling to the wall. The home-crowd roared as Smith set his eyes on the plate sliding just underneath the tag for an inside-the-park home run. 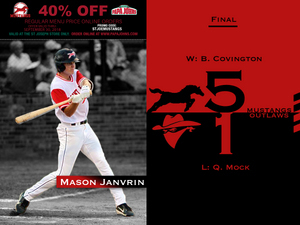 The hit scored three as the Mustangs pulled away from the Outlaws on Saturday night 5-1. The first 500 fans in attendance received a limited edition 10th Anniversary Mustangs T-shirt courtesy of Carriage Square Living and Rehab. St. Joe struck first for the third-straight game. Smith connected on a Quest Mock pitch sending it to deep-left field and off the wall on a bounce. Centerfielder Mason Janvrin came around to score giving the Mustangs a 1-0 lead. Starting Pitcher Brennon Covington turned in another dominant performance for a Mustang’s pitching staff that has established themselves as one of the best in the MINK league. He locked in early and left hitters mystified at the plate. Covington pitched six innings, giving up just five hits while collecting ten strikeouts. Brody Santilli singled to begin the bottom of the fifth inning. The left fielder worked himself into scoring position and stole a run on a pitch that brushed the dirt and skipped to the backstop. The run doubled St. Joe’s lead before Smith’s seventh-inning homer. The Mustangs faced adversity in the seventh as Joplin loaded the basses. Jonathan Lynch took to the mound and eliminated the threat, striking out two batters and holding the Outlaws to just one run. With the win the St. Joe takes two out of three in the weekend series. Mustang’s fans celebrated the win by painting the sky red with the Mosaic Life Care fireworks spectacular. Brennon Covington pitched six-scoreless innings giving up just four hits with ten strikeouts. Zachary Smith went 2-4 with a home run and four RBI. Mason Janvrin went 2-4 with two runs. Brody Santilli went 3-4 with a walk and two runs. The Mustangs are 7-1 when scoring first this season. Covington has collected ten strikeouts in each of his first two starts. St. Joe will travel to Jefferson City to take on the Renegades (6-6) at 3 p.m. Sunday. The Mustangs will be back at Phil Welch at 7 p.m. Tuesday taking on the first place Sedalia Bombers (11-4) in the opening game of a five-night-home stand. Come on out for We Love St. Joe Night and earn Free General Admission, with any size donation at the gate to Noyes Home.